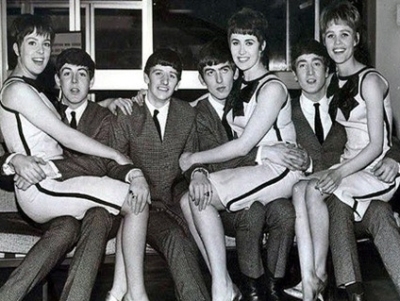 Many years ago the chap in the football strip above was dubbed the “The Fifth Beatle” or “El Beatle”. This came from the Portuguese press after he scored a goal for Man Un a 4 – 1 win against Benfica in the European Cup in 1965. 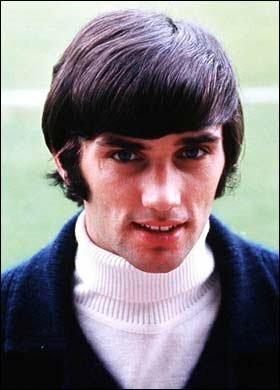 This naming was mainly due to his Beatles-style “mop” haircut, which was popular with everybody at the time, including George Best. He was one of the many given this title. Little known fact: Despite both the footballer and the band having the same sort of adulation at the same time, neither George Best or The Beatles ever met. The question has often been raised whether any of The Beatles liked football. The subject was also covered in depth a couple of years ago by the excellent Run of Play. Then a short time later Paul McCartney revealed that he is an Evertonian, but the band weren’t all that interested in football. But football liked The Beatles. I’ve found a few scraps of evidence from various places, some bits of audio that are football and Beatles music related. The first one though I think that everybody would like to disown really… especially those of you down the Carrow Road way… No more information is available as to who, why, when and how this was done. Which is probably a good thing. – The only other reference to football by John was on the Wall and Bridges in which the album cover was a painting he did as a kid in 1952 of the FA Cup Final between Newcastle and Arsenal. As you can see I timed this post to go out on December 8th, the day the world lost the genius of John Lennon… This is my F&M tribute to someone who has been a huge influence and had a profound effect on my life. So long ago…Was it in a dream, was it just a dream…? i have seen a picture of the four Beatles together, a headshot with all looking to their left. paul is wearing a liverpool fc supporters ribbon. have been unable to find subsequently, however. Great post! A few months ago I edited the Wiki link above to “Walls & Bridges” adding a section explaining the album cover but it appears to have been removed. Correct about the Newcastle v Arsenal ’52 cup final. Also – dswilliams, I know exactly the picture you’re talking about and I might have it in a magazine at home. I’ll try and dig it out, scan it and send it in, somehow.